wowwww, thanks for sharing that!!! Very nice. Yes, I have one of those, too. I want one. Way cool! What a find Great job thank you so much! Apparently printed before DeForest Kelly was hired. Cool find — thanks for sharing! Awesome piece of Trek history. Whatever happened to Paul Fix, Lloyd Hanes and Andrea Dromm? Their replacements are legendary. LLoyd Haynes went on to a number of projects, including a starring role in an ABC series I watched every week and still remember fondly: Room 222. Wikipedia says Haynes was dropped from Star Trek because Roddenberry liked Nichelle Nichols and her role of Uhura better for Star Trek. Sadly, he died of lung cancer in the late 1980s. IMDB shows a long list of productions, in which he appeared. Perhaps you can find some or all of them via Netflix, YouTube, or other means. Nice! too bad it isn’t a little clearer so you could read it. That’s really cool. I’d love to be able to read it. One will always wonder how Paul Fix (a much underrated actor) would have played the Enterprise’s Chief Medical Officer. Of course the series would not have been the same without Bones (Dr. McCoy), and he became a very important part of the crew. (And gave us the most remembered 3-word line from TOS: “He’s dead, Jim”). We will always remember DeForest Kelley. Or his comment: “I’m a doctor, not a ____________” (fill in the blank). Kirk’s “Beam me up, Scotty.” wasn’t. Lots of lines close to it… but ever that on. Wow this was really great, a great historical reference for all Trek lovers. No apostrophe in agencies or booklets. Plurals are not possessives or contractions. Please correct. it takes the air out of an otherwise fascinating article. You’ll also notice that both pictures of Spock had his ears and eyebrows airbrushed to remove the points and make them appear human. 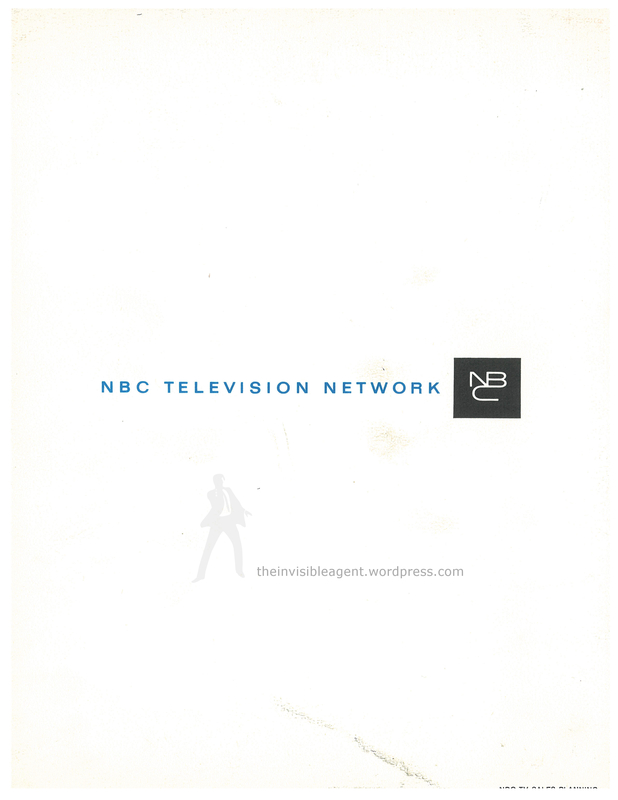 NBC was concerned at the time regarding his devilish appearance and that it would make it harder to sell the show. Such a great piece of history, thanks for posting. But for goodness sake, if you’re going to post articles online for the world to see, please bear in mind that plurals NEVER require apostraphes! An apostraphe is used for a contraction or when indicating possession – never, EVER for plurals. I wonder how many of these booklet’s are still out there in the wild’s. I’ll bet most advertising agency’s just dumped these without realizing how valuable they might be year’s (or decade’s!) later. Thank’s for posting this incredible find! Do you have any other’s? I know its wild! These were actually found in a trash can in the mid 80s, so they had been sitting in cabinets for decades even before they were dumped. We’ve got a few other thing we’ll be posting in the next few days so check back. Hopefully everyone will enjoy them also! May even get a bonus apostrophe or two! Thanks very much for posting this. It took me back to 1965, and the time I visited the local NBC affiliate when both Star Trek and “I Dream of Jeannie” were on the air. When TV was still going through the transition from Black-and-White to “Living Color,” I walked into the reception area of this TV station and saw huge color pictures of Star Trek and Jeannie casts. It was one of those moments that sticks with you, much, I suppose, as people who attending the first screenings of The Wizard of Oz experienced, when the film shifted from Kansas-gray monochrome to vibrant Oz color. Sorry. I meant 1967. I was ten years old that year. Is Kirk holding a can of Apple Juice in the first pic? 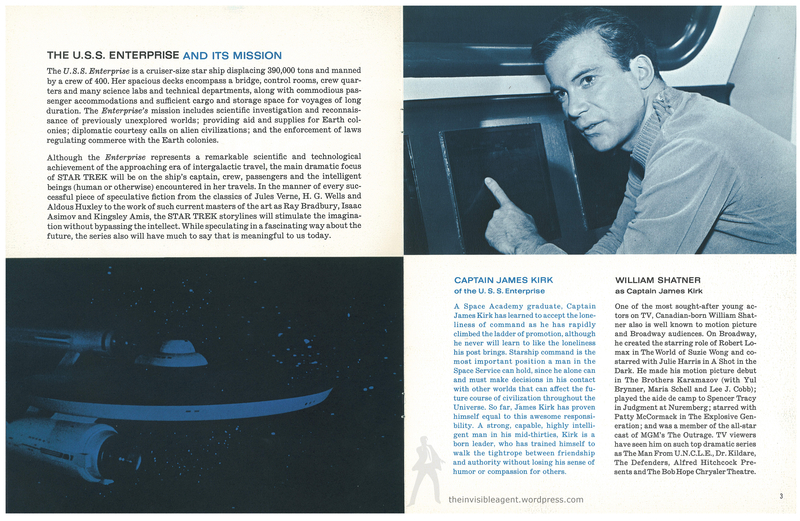 This was reprinted in Herb Solow and Bob Justman’s great book, Inside Star Trek: The Real Story. Great and insteresting! Awesome!!!! I really enjoyed this. 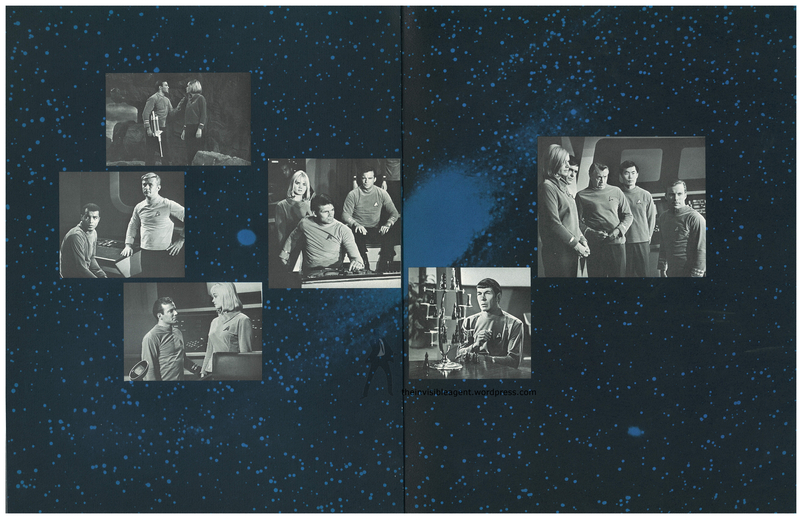 This available on the peerless ‘Inside Star Trek’ book written by Herb Solow and Robert Justman. Fascinating. 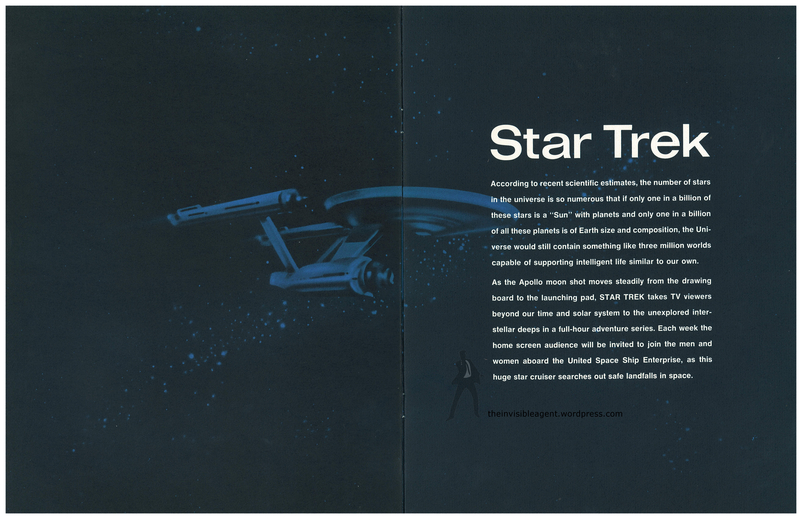 When you think of the high powered gloss that now accompanies mediocre TV productions, it is remarkable that such modest promotional material sowed the seeds of what Star Trek turned into. Content is king … as the Big Bang Theory is proving today. Awesome post! Nice how the NBC machine misspelled Nimoy’s name once. It’s even circled in your copy. I’d love a copy of this! This is truly a treasure find! Thanks for scanning it and posting it. Love to see more! No problem Danny! Keep checking we posted a internal letter yesterday from Gene Roddenberry and have a some items I’m in the process of scanning in and posting. Glad you enjoyed! 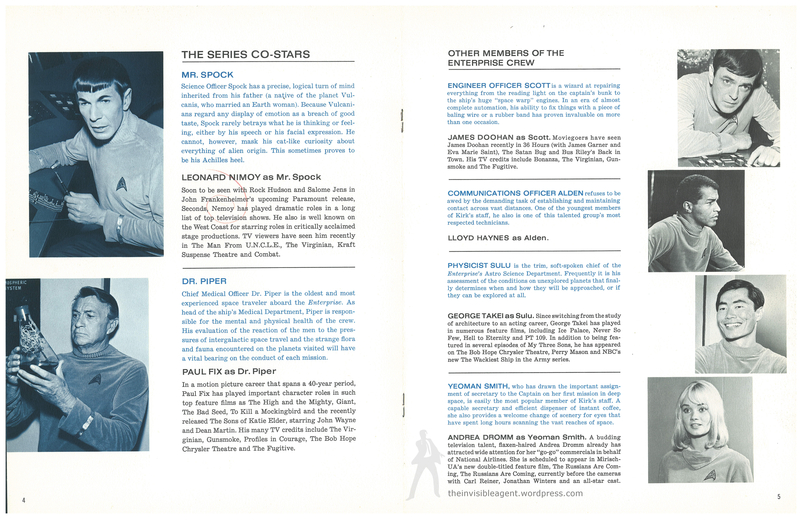 Spock’s ears are only SEMI-pointed on the inner page featuring the paragraph on Leonard Nimoy and completely NON-pointed on the image shown on the back cover (space chess). What are the dimensions? I’d love to print this out and re-create it on paper but would like it to be the correct size. 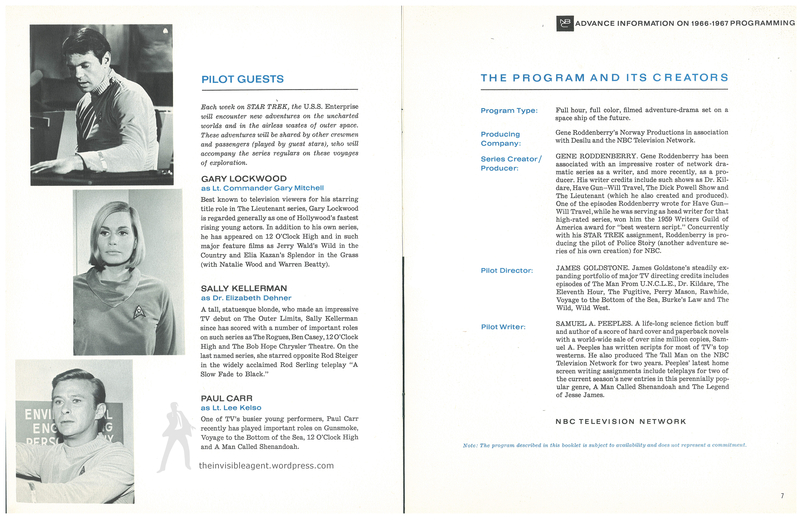 I have an actual copy of this brochure (I came across it while working in advertising in the 1980s and cleaning out file drawers)…do you think that any one would want to purchase it ? and for how much? 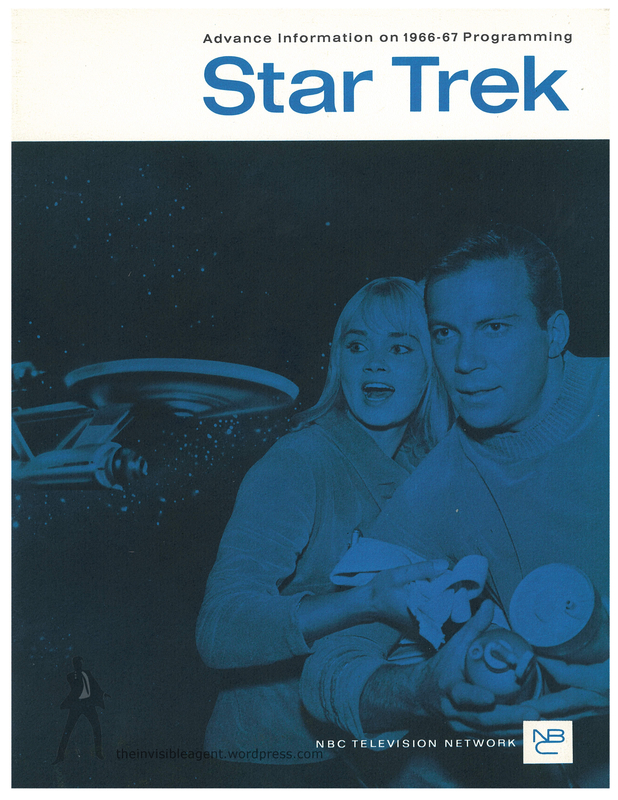 I loved all the Star Trek programs that followed. Am not a collector but have held onto this for years – it was truly a piece of TV history…any feedback appreciated – I tried to find out how to find a buyer years ago. Thanks. The person that had this one had a similar story…found it in the trash. I honestly have no idea what this is worth, but judging from the response that it’s had here on my blog, I’d say that it would make a die hard fan very happy. Off the top of my head, maybe you could contact Metropolis Comics about determining a value. I have no idea what you’re looking to get for it, but I would possibly be interested. I will ask what the original size was…It belongs to a friend of a friend. I will measure when I locate brochure —pretty sure it was same as standard paper (as I have it in a manila folder) must be around 8 1/2 by 11 inches —but promise to follow up really soon. My guess was correct —I measured the Star Trek Pilot brochure and it is indeed 8 1/2 X 11 the standard size of plain copy / printing paper. Thanks so much, Margaret! Looking forward to printing up a simulated version for myself.